This information is provided as a public service from PanamaCityRealtyGroup.com. Bay Dunes is a championship 18 hole public facility built in 1988. 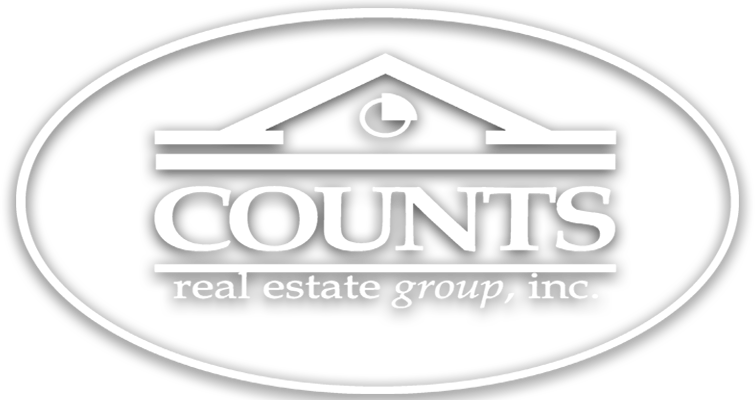 Nestled in the rolling hills 7 miles north of the Panama City Mall off U.S. Highway 231 with easy access to Panama City hotels and beaches. Prices are resonable and T-Times are available to accomodate the busiest schedules. Annual Memberships are available as well as Leagues for both seniors and juniors. Bay Point Meadows 100 Delwood Beach Road, Panama City Beach. 850-235-6909 Offiers Semi-private driving ranges and dining facilities Course features include: Par 4s are the strength of the course that is fair, although a little tight to some players' liking. Greens are big and not too severe. From the middle tees, it's a good course on which to post a low score. Tee times required for all play; non-members should call in advance. Par: 72. Bay Point Lagoon Legend 100 Delwood Beach Road, Panama City Beach 850-234-6909. Offers Semi-private Driving ranges and dining facilities. The Course features: undulating fairways highlighted by numerous mounds. More than 100 sand traps are featured and water comes into play on 15 holes. Considered one of northwest Florida's most difficult test of golf skills. Holiday Golf Club 100 Fairway Boulevard, Panama City Beach 850-234-1800. Semi-private. A lighted 9-hole Executive Par 3 Course opened in December of 1995. Driving range and snack bar are available. 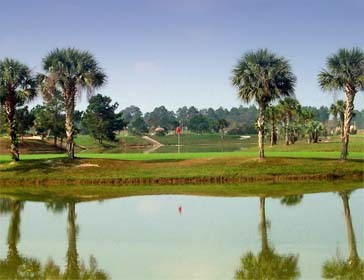 Course features: Favors the left-to-right golfer, with large greens and forgiving fairways along with plenty of water. The new nine-hole course was built with the entire family in mind as well as the scratch golfer. 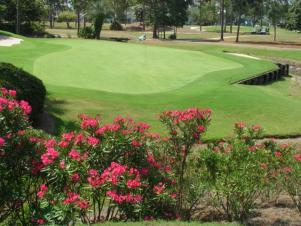 Hombre Golf Club 120 Coyote Pass, Panama City Beach 850-234-3673. Offering, Semi-private driving ranges and snack bar. Members may make tee times up to two weeks in advance. Non-members may make tee times up to seven days in advance. All other play is first come, first served. Course features: Pinpoint accuracy is required to play the layout well. Greens are small, a throwback to old-style courses. Signal Hill 9615 N. Lagoon Drive, Panama City Beach 850-234-3218. Open to the Public. Walking or carts allowed and a Snack bar is available.